I can’t believe we’ve reached the end of the month already. Really, where has February gone? For me, it’s been a blur of working on a number of different projects, in between getting ready for Fibres West, which is happening March 22 & 23 in Cloverdale. Will I see you there? I hope so! Without further ado, let’s talk about the photo inspiration for this month. This image is one that Eric took last summer while he was hiking the Nootka trail. It was a long exposure where he moved the camera back and forth. It was taken at sunset, overlooking the water, and for me, it brings me a great sense of calm. 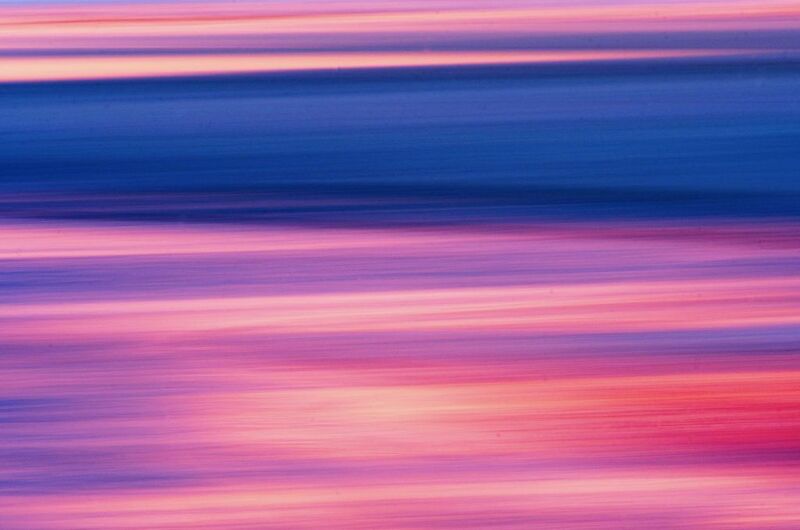 I love the interplay between the blues, pinks and oranges and it’s what made up my colour palette for this month’s club. 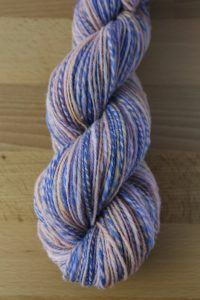 This month was Rambouillet for basic club and Rambouillet blended with Yak for Luxury club. I do have a set of rolags set aside for me to spin… I just didn’t get to them this month. 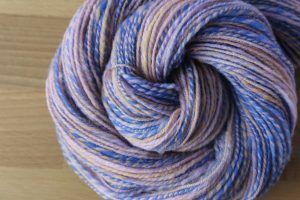 Instead, I’ll let Rachel, from Wool N Spinning, share her reflections about club! Last month, we discussed being pushed outside our comfort zone with fibre. This month, we are going to discuss comfort-zone pushing when it comes to fibre preparation. 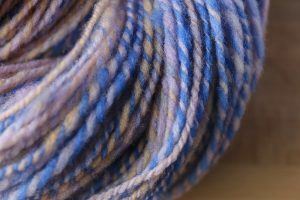 How often do we tend to spin the same preparation because we love the finished yarn we achieve time and again? 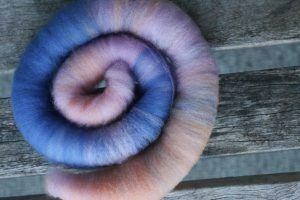 Do you always prep from raw fleece and comb to create a true worsted yarn? At fibre festivals, are you drawn to the braids of combed top that you are able to stripe down and spin short backwards draw? I have to admit, that’s my default. 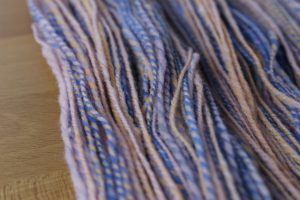 When I want a potato-chip spin, I go to a braid of medium to long wool, such as Corriedale or Romney, stripe it down and start spinning. No forethought or planning goes into those mindless, enjoyable and deeply meditative spins. I will often choose those spins when I feel there is something I need to work through in my life, a choice I am trying to make or a pivot that is imminent. I rarely spin from rolags and I rarely spin long draw anymore. While I used to use long draw a lot, I have tended toward worsted-drafts in the recent months due to the amount of sock spinning I’ve been doing. This spin pushed me out of my comfort zone and forced me to utilize a technique I hadn’t use in a while. Did I enjoy it? I sure did. I absolutely love long draw – it’s smooth and repetitive. I love the rhythm and motion. I love the feel of the single pulling onto the bobbin as it takes enough twist. I love drawing out the fibres prior to that gentle pull. It’s definitely an adjustment for me to not spin club every month and I am missing it. I do hope that I’ll get back to it soon. In the meantime, I’m loving seeing what Rachel is doing and hearing her thoughts about it. I would love to see what you do with club! Please feel free to share it over on this thread in the Wool N Spinning Ravelry Group or tag me on Instagram with the hashtags #craftyjaksboutique or #craftyjaksclub If you haven’t signed up for club and you’d like to, please follow this link to my Etsy shop. If you’d like to receive April club, be sure to sign up before March 20th!